Open Motif 2.3 (Appendix G - New Features in Motif 2.3) and later give programmers the ability to show pixmaps and label strings simultaneously in Labels or Buttons. 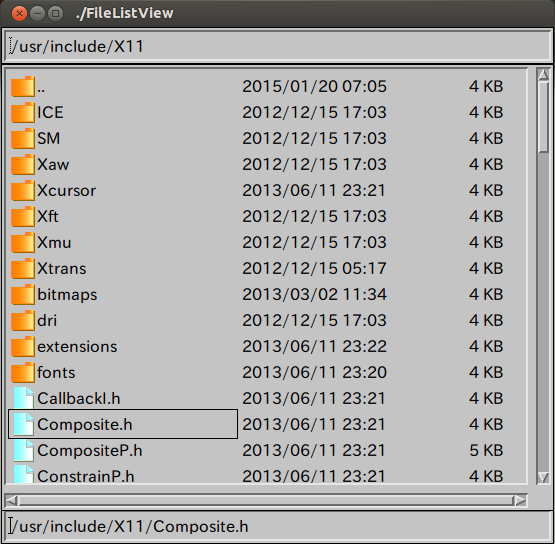 The following FileListView program is an example to display folders and files with pixmaps in FileListView class((Motif++ 1.0.4). Please note that in this example we use a structureNotify event handler to layout textFields and fileListView created in MainView constructor in our original way, without using standard layout managers in Motif. //Copyright (c) 2015 Antillia.com TOSHIYUKI ARAI. ALL RIGHTS RESERVED.